Are You Expressing True Love? Everyone thinks he knows what real outgoing love is — but few do. Even fewer realize the vital importance of expressing it. Every human being is just naturally interested in his — or her — own things. He knows nothing else! He is interested in his own pleasures. His own happiness. His own profit. HIS own importance. Charm. Effectiveness. Success. Friends who mean a lot to him. Often, he is concerned for others only when he is reminded that he should be, and then it is because doing nice things makes him feel like a better person. A small sacrifice or a charitable act becomes a means of self-exaltation. To do something nice for others makes him feel good, and makes others admire him. Yet, in his own mind he thinks he has "love." Truly, as God's Word tells us, man's heart is deceptive above all things and desperately wicked (Jeremiah 17:9). One of the saddest commentaries of our time is the lack of genuine love and concern for other members of the human race. Almost everyone suffers from the loneliness of being shut out from the thoughts and actions of others. Loneliness has come to be a major problem in our modern way of life. It has probably been the cause of more delinquency, destructive acts and desperate behavior than any other single factor. As Norman Roston wrote in the article "The Ones Who Wait," published several years ago in The Saturday Evening Post: "You can see them [the unloved] in the city or town, men or women, the young and the old, gathering in the late afternoons or evenings, strolling in the streets, or wandering through stores or the parks, or sitting on park benches, or heading for bars. They are in search of others, the unnamed, the yet-to-be-found, the hour-long or night-long companions. And the numberless unseen who merely wait alone in separate rooms, in small, desperate rooms, their hope behind, accepting defeat. These are the ones who have somehow missed the miracle. Passed by while others were chosen. "Perhaps the saddest of these are the aged and ill, betrayed by the world, forgotten by kin. The living turn cruelly and irrevocably away from the dying. And love, the root of life, withers. "It is not merely a matter of age. The loveless exist wherever life may be. They are the obviously scarred or the seemingly well, the wounded with the scar hidden; they are married or single, in and out of careers, in and out of marital beds or motel adventures, all touched by that shadow of having been denied, forgotten, un blessed." This is a pitiful, sad commentary on real life! Perhaps you feel that you are being left out of the affection and concern of others. But what are you doing for others? How about you? Do you have any loved ones going hungry for a word of encouragement, a note or visit that says you care about them? Truly, outgoing love is in desperately short supply in this generation. If you and I are not careful, we will fall right into the trap that so many people without any knowledge of God's truth are in. But if we will begin to exercise outgoing concern ourselves, our own loneliness will evaporate. Even though this godless generation makes goodwill difficult, it is still necessary for human happiness. Life without personal warmth and goodwill is not real living. People need to see a smile and receive a cheery greeting that somehow conveys interest in their welfare, with a willingness to stop and help when necessary. Such love is a vital part of any happy society. And it will be a prominent, personal, daily quality in God's Kingdom. This godless age makes goodwill difficult, but it is still vital to happiness. Life without personal warmth is not real living. Those of us who are able to see that outgoing love is a part of God's way of life, and who have chosen to come out of this world and to learn and practice God's way, may not excuse ourselves from having and practicing outgoing love and concern for others. It is an absolute requirement for any who expect to enter His Kingdom. Those who have not demonstrated genuine outgoing concern for others in their daily lives will not enter at all (Matthew 25:31- 46)! To those who do not aid the stranger, the hungry, the thirsty, the naked, the sick and the confined, Jesus Christ will say, "Depart from Me, you cursed, into the everlasting fire prepared for the devil and his angels." True love is so important that Almighty God warns those without it that they are as worthless as "sounding brass or a clanging cymbal" (I Corinthians 13:1). A personality devoid of outgoing love is a sick personality! It is unpleasant, unwholesome and ineffective. On the other hand, an outgoing personality adds immeasurably to health, happiness and prosperity. It is a delight to everyone, and it will certainly make the lives of those around much brighter and more worthwhile. The apostle Paul wrote: "Though I speak with the tongues of men and of angels, but have not love, I have become as sounding brass or a clanging cymbal. And though I have the gift of prophecy, and understand all mysteries and all knowledge, and though I have all faith, so that I could remove mountains, but have not love, I am nothing" (I Corinthians 13:1-2). This knowledge comes only from the Bible, and understanding comes from God's Holy Spirit, which no one possesses naturally. Without God's Holy Spirit, the only genuine interest we have is self-interest. Unconverted people are interested in others only In relation to what others mean to them — what they get In return. Since this world's advisers are without God's Spirit, their writings or examples unwittingly advocate "putting it on" in order to receive. But giving in order to receive is not goodwill. It is pursuing self-profit. All of us have heard about love and goodwill from people who don't really understand it. We have seen others' examples of what it is supposed to be, but we have received wrong information. Right knowledge was simply not available because of a lack of spiritual understanding. Yet even some who have been baptized, have God's Spirit, know God's plan and hope to enter God's Kingdom lack this outgoing love. They just don't think about others. Their fruitless lives make it obvious that they do not actively care for others. They intend to do right. They often think to do good works, yet seldom get around to actually doing them. They try to be nice. They often say and do pleasant things. They try to be fair. Yet, no one is benefited. No one's life is being changed. No one's hope is lifted up. No happiness is radiated to others. No joy is spread. Instead, they are forced to rationalize, defend themselves, argue or retreat. This kind of behavior falls far short of truly outgoing love. In fact, it is not love at all! It is merely living up to what we feel is required of us. It is a person's way of demanding credit for being nice. It is selfish. Goodwill or true outgoing love must come from a Spirit-led heart. Even though the heart of man is not naturally inclined to love his fellows, through God's help we can change. And there is a lot we must do ourselves! The formula for receiving God's Holy Spirit is given by the apostle Peter in Acts 2:38. Peter said to those pricked in the heart and wanting to do something about their condition: "Repent, and let everyone of you be baptized in the name of Jesus Christ for the remission of sins; and you shall receive the gift of the Holy Spirit." Repentance means turning from your human way of self-centeredness and pursuing God's way. It means repenting of breaking God's law and setting your will to obey from here on. God will then give you His Holy Spirit, a spirit of a sound mind — wisdom by which you can intelligently love and consider others. You cannot work up goodwill by yourself. To act like you have it is to be false. Any act, no matter how good, is eventually discovered to be just that — acting. On the other hand, when we receive God's Holy Spirit we do not just automatically and mysteriously become perfect. We work toward perfection — with much effort on our part — using the Spirit God gives. God's Spirit opens our minds to realize the importance of others in our lives and our importance in theirs. The goodwill we give and receive is a vital commodity. We come to realize that fellowship of kindred spirits is most beautiful. God's Spirit also gives us the assurance that this harmonious love and goodwill is worth working for. God's love does not give up. When all else has failed, true love — outgoing concern — will still be going strong. If you would like to know more about this vital key to true outgoing love, read our free reprint article, "How You Can Be Imbued with the Power of God." Outgoing love requires work along with willpower and determination. It is an uphill pull because human nature is not naturally outgoing. Human nature, as influenced by Satan the devil, the "prince of the power of the air" (Ephesians 2:2), is selfish. To be outgoing in love cuts against the grain of what we have been absorbing through Satan's influence all our lives. Wisdom to try — wisdom to correctly guide your efforts, wisdom to keep trying in spite of all adversity, wisdom to discern God's will — is an absolute necessity in learning to exercise true love. "If any of you lacks wisdom, let him ask of God, who gives to all liberally and without reproach, and it will be given to him. But let him ask in faith, with no doubting" (James 1:5-6). In faith, you must stand unwaveringly on your trust and conviction. In hope, you guide your action expecting to receive the desire you have set your heart on. This hope adds the spiritual motivation to go forward. In love, you must act with unselfishness, with initiative and genuine concern for everyone. These three important ingredients are added to your gift of wisdom through effort on your part. They are all important, but the most important, and the one that takes most effort, is love (I Corinthians 13:13). This is what life is all about. This is how you have your part in your own salvation. This process of creating godly character in us is God's plan of creating children. It is His doing, but we also have our part. Besides our willpower and determination, it takes our resourcefulness, perseverance and drive. It requires breaking old habits — habits of thinking and acting selfishly. It then requires building new habits — habits of thinking and acting in outgoing love. The old habits are deeply ingrained, just as the new habits must become deeply ingrained if they are to become part of us. To build a habit you must do a thing over and over until it becomes automatic behavior. It has been said that we are what we habitually are, and you become godlike when you become habitually and consistently godlike. God is love and He acts habitually and consistently in outgoing love. That is what we are learning to do through His Holy Spirit. The basic laws of God are given for the purpose of developing godly love and goodwill. They are laws of love (I John 4:8). I Corinthians 13 makes it clear what true love is. The word translated "charity" in the Authorized Version does not mean "giving to the poor." Verse 3 clearly demonstrates that — read it yourself. The Greek word translated "charity" is agape, not phileo, which is more commonly used to denote emotional love. Agape and phileo have similar meanings, but phileo "comes chiefly from the heart," explains Strong's Exhaustive Concordance, while agape "comes from the head." It means to think and act toward others with genuine concern and tenderness. It means having goodwill — feeling it deeply but intelligently. While either word can be translated "love," the Authorized Version translators used "charity" to distinguish this intelligent, heartfelt concern (outgoing love or goodwill) from the kind of emotion that the word love conveys to the average person. Verse 4 shows that this agape, this intelligent outgoing love or goodwill, is always patient with others, suffering long with any grievance received from them. It is kind — unfailingly kind — as you will see by comparing verse 4 with verse 8. Love never compares itself with others (II Corinthians 10:12) so that it is never envious (jealous), never vaunts itself (boasts) to get self-acclaim. It is never puffed up (arrogant, self-important). Such puffed-up ego only shows that you have compared yourself with others and found them beneath you. Goodwill will never behave itself unseemly (unpleasantly, unbecomingly). 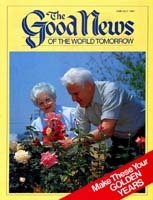 Philippians 4:8 also adds information on the pleasant things we should do instead: "Whatever things are true, whatever things are noble, whatever things are just, whatever things are pure, whatever things are lovely, whatever things are of good report, if there is any virtue and if there is anything praiseworthy — meditate on these things." True love seeks not its own — is not self-centered, not carnal (I Corinthians 13:5). It is not easily provoked (aroused to anger). It thinks no evil — does not dwell on the ugly, wicked side of others' behavior, nor is resentful or bitter. And it never rejoices in hearing or seeing iniquity. Instead, it rejoices in truth — in wholesomeness (verse 6). If a person belittles or insults you, real love never causes you to rail back, but it bears all things (forbears in all provocations). It never inflicts harm for harm, evil for evil or insult for insult. This agape believes the best in all matters. It does not show unpleasantness and ill will by doubting or causing dissent, but hopes for the best in all things — is not negative. God's love endures all things. Trials, unpleasant episodes, differences of opinion, misunderstandings do not send it off in a corner to mope or to turn away in bitterness. It does not lose friends over them. It does not give up. It never fails! When everything else has failed, true love — genuine goodwill and outgoing concern for others — will still be going strong. Jesus Christ's example while on the cross is the one we should strive to follow. He said of all His scowling, bloodthirsty, hate-filled tormentors, "Father, forgive them, for they do not know what they do" (Luke 23:34). Can you still be a friend to those who hate you? Can you still have goodwill toward them? Can you still be concerned for their welfare? You must, you know! And, you must come to have it habitually and consistently. If you want to live and act in love and goodwill, go to the Author of all that is good. Ask Him prayerfully to give you this attitude and show you the way. Expect Him to answer and to keep on giving it to you as long as you are trying to give up your old self-centeredness and striving to live God's way. Then follow God's biblical instructions on how to behave toward others in love and goodwill. Live by the laws of love. Your selfish human nature has always had its way in the past and will continue to crop up, so you must continue to resist self-will while you step out on faith to do God's will — goodwill! Like a baby's first steps, your first attempts may not be very skillful. You may stumble — you may even fall. But dust yourself off, ask forgiveness and try again and again, until you habitually come to have goodwill — God's will — toward all people. Romans 13:8-9 says: "Owe no man anything, except to love one another, for he who loves another has fulfilled the law. For the commandments, 'You shall not commit adultery,' 'You shall not murder,' 'You shall not steal,' 'You shall not bear false witness,' 'You shall not covet,' and if there is any other commandment, are all summed up in this saying, namely, 'You shall love your neighbor as yourself.'" It takes work to be outgoing. You won't even think to do it without effort, and it won't be successful even then if you don't stay close to God. This also takes effort of will and energy. Yet, this love is absolutely required by God. It is a wonderful thing to have. No one will enter His Kingdom without it (Matthew 25:31-46). Now is the time to marshal your energy to make certain you have God's great love. Develop it and radiate it all the rest of your life. The time is short. It is later than you think!